How you may help "Sign the Route". to our preservation and restoration efforts. In short, this should be a Route-Wide group effort. Those who are interested, and who reside close to Route 66, will need to "carry the ball" where they live. 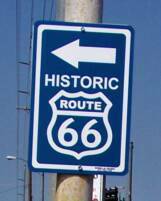 In the best interest of existing businesses along the Mother Road, Route 66 organizations are making adequate signage on the original Route a top priority. Restoration and preservation projects are commendable acts, but that hard work goes unrecognized when Route travelers take the wrong road and miss the true icons and deserving businesses they are looking for. I hope the Route 66 Chamber of Commerce will be writing another chapter of Route 66 history here. Bob Kooy, owner of Autoglass Outlet, donated $50. to fund this 18" X 24" large sign (#8) that was installed on his sign post at Zora and Rangeline, on 9-26-07. This sign was removed once the turn was marked by a new "Byways" sign in 2010.
especially foreign visitors who must arrive in California in time to catch their flight home. do not deserve their patronage because they do not "respect" their own Route 66 heritage. It is a fact! 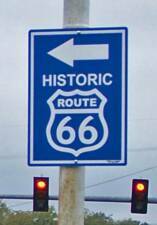 towns, counties and states with poor Route 66 signage lose tourism dollars! works department to make signs difficult to steal. 1. 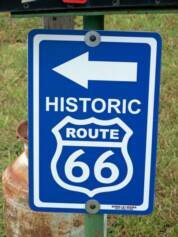 Route 66 "Scenic Byways" signs in Missouri are mounted with simple nuts and bolts! Even though they flatten some threads, it still takes only moments to steal the sign. Why not use "Tamper-Proof" nuts and rounded carriage bolts with large washers? 2. 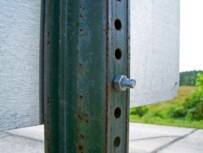 Use a two-part metal epoxy bonding glue (J-Weld) to literally glue the sign to the post! where the sign was placed. 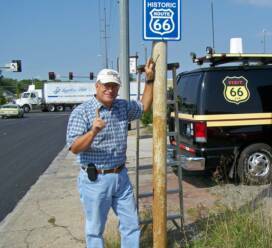 Yes, these methods will initially make signs cost a little more, but will soon pay for themselves by keeping the signs in place longer, making Route 66 travelers happier and communities a little richer. The following individuals and organizations have donated the cost of one, or more, signs. We will be adding photos of other installed sign(s) and details as well, so please check back....and thank-you again for helping The Mother Road restore it's identity. Bob Moore, Editor of Route 66 Magazine, donated $50. 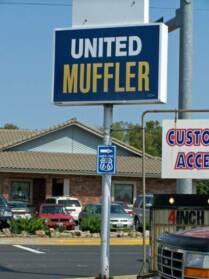 for 1 large sign which was put-up on Route 66 in Carthage, MO. on Wednesday, Sept.26th..
Left: Pat & Jennifer Bremer from Speedway, Indiana donated $25. for this sign. United Muffler allowed the sign to be installed on it's sign post on the corner of Garrison, indicating a right turn onto Central Ave. for Eastbound traffic. Note: As of 6-15-10, this is still the only sign marking a right turn for eastbound travelers! Left: David Waller, owner of Shelter Insurance in Carthage, allowed this first sign to be placed on his unused sign post. Right: Rod Harsh with the first sign that was installed on Central Ave. entering Carthage from the East, indicates a left turn onto Garrison. 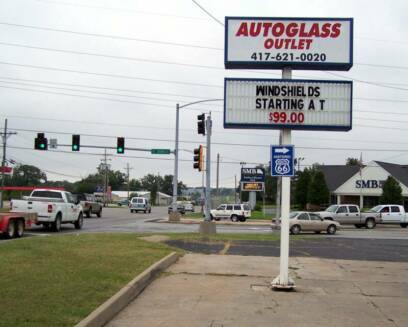 This 12" X 18" sign was replaced by a 18" X 24" sign on 9/26/07 for better visibility at this busy intersection. The larger sign (#7) is shown in the lower-right photo. The original sign #1 will be used at another location. 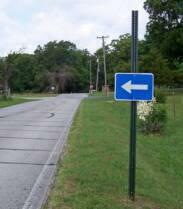 Note: This sign removed when new "Byways" sign was installed in 2010. Left: Sign #1 was later re-installed at the east approach curve on Old 66 Blvd. in Carterville. The sign was mounted on a steel mailbox post courtesy of owner Matthew Whitmore. 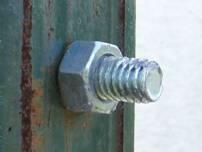 Right: To reduce the possibility of theft, carriage bolts were used. 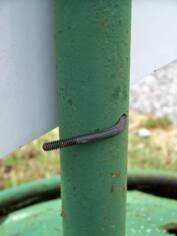 Placed through large washers, the bolts were hammered around the rear of the post. The new "Byways" sign (100' away) has already been stolen! 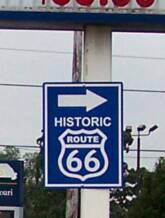 The Route 66 Chamber of Commerce has continued to install it's self-funded signs where state-installed signs have been stolen or damaged. 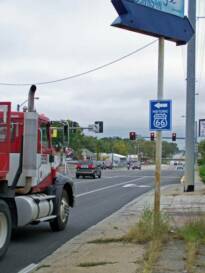 Missing signs have been reported to the Route 66 Association and MODOT, however it appears that there is a lack of interest in replacing the signs, and making sure they cannot be removed by using tamper-proof nuts and bolts. In other situations, the State signs are placed improperly at intersections, creating a risk to visitors who are on a high-speed highway and cannot safely make the turn to the original Route. 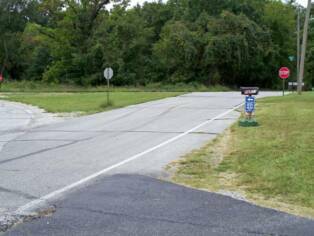 ​Additionally, the State of Missouri operates it's own Scenic & Historic Byways System, and is not participating in the Federal Historic Highway System, so it is not listed as such and overseas visitors cannot receive information about this State. 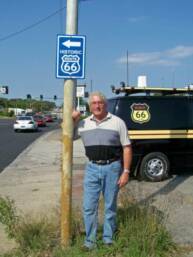 Since the State adopted the provisions and regulations related to the American Highway Beautification Act that now apply to the State of Missouri, MODOT has heavily restricted signage needed by businesses to direct Route 66 travelers to Dining, Lodging, Historical Sites and other points of interest that depend on signage to survive! Their excuse is that allowing signage, it would open the door for unrelated Route 66 businesses to place billboards. When asked by the Chamber to simply determine if the sign applicant would qualify for a small sign where needed, and can show that their business is of historical or tourism related business, then they could deny unrelated advertising. It is interesting though, that MODOT does allow a small sign for an annual large sum of money....money the business may not be able to afford. ​The Route 66 Chamber continues to seek a hearing on this problem. We have contacted the State Tourism Office and several local officials with no response, and we have yet to obtaining answers to our questions If this situation cannot be resolved in time for the early travel season that begins in March, we are prepared to launch a petition to demand the State of Missouri to allow Route 66...a former Federal Highway....to rescind it's signage regulations and allow the Mother Road to become part of the proposed American Historic Highways System. More details about this Chamber project will be posted with links on the home page. Go to our new CHANGE.ORG Petition and sign it!